The Nation’s Elite Young Sailors Ready to Compete at U.S. 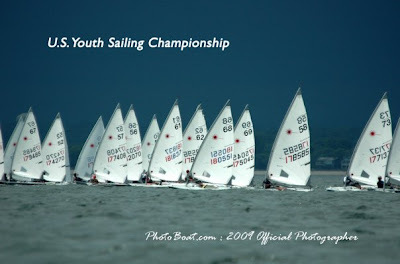 Youth Sailing Championship US SAILING Championship Season Begins Today at Indian Harbor Yacht Club in Greenwich, Conn.
Every sport season has their eagerly anticipated and much celebrated opening day. US SAILING, the national governing body of the sport, presents its version of opening day for the summer and fall seasons with the U.S. Youth Sailing Championship on June 25-30, hosted by the Indian Harbor Yacht Club in Greenwich, Conn. Sponsored by LaserPerformance and Gill North America, the U.S. Youth Sailing Championship is the pinnacle of youth sailing competition in the United States. The waters of Long Island Sound will be the site for this year’s championship, where 116 of the country’s top single- and doublehanded young sailors, both girls and boys, ranging from 13 to 19 years of age, will race Lasers, Laser Radials, 29ers, and Club 420s. US SAILING has selected this field of sailors from across the country, including the U.S. Virgin Islands, based on their sailing resumes and performance at regional, national, and international competitions. Among those to watch in the Laser Radial class will be Marissa Lihan (Ft. Lauderdale, Fla.). She has been consistently improving over the past year, and in 2008 she finished second at the U.S. Junior Women’s Singlehanded Championship. She won the ISAF Youth Worlds Qualifier this year, and after the championship she will leave to represent the United States in Brazil at the 2009 Volvo Youth Sailing ISAF World Championships. Lihan is also a member of the US Sailing Team - U18. She will be rivaled by Boston College standout, Anne Haeger (Lake Forest, Ill.), who won the 2008 College National Singlehanded Championship in Laser Radials.